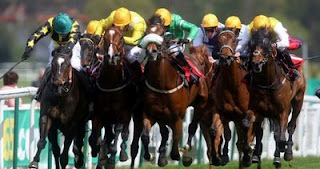 IP finance: Horse race sponsorship: what is central to centralised deals? Horse race sponsorship: what is central to centralised deals? Earlier this week BrandRepublic published a piece by Ed Kemp entitled "Horse-racing industry targets centralised sponsorship". I'm not usually interested in horse-racing, but I'd never heard the term "centralised sponsorship" before. "Key players in the horse-racing industry have called for a radical shake-up of its sponsorship structure to allow it to compete with other mainstream UK sports. Football, rugby and cricket have all benefited from centralised marketing functions, in which the sport's governing body sells league or competition sponsorship packages, and clubs seek individual deals. Speaking at an industry event, ... experts argued that the ability to offer sponsorship packages across multiple events would help prevent the loss of blue-chip backers. Last year, Vodafone ended its long-standing title sponsorship of the Derby, leaving the event struggling to secure a partner for this year's festival. Jon Stainer, business development manager at Sports Marketing Surveys, explained how cricket had capitalised on a centralised set-up. 'In cricket, the ECB's Commercial Partners programme promoted loyalty, while title sponsors received reciprocal rights across competitions. It also helped raise consumer awareness of these competitions, according to our research,' he said. ... McNeile claimed that Cheltenham Racecourse, along with horse-racing regulator The Jockey Club, would be ideally placed to lead the process of developing a centralised body to sell bundled sponsorship rights. He added that he hoped other racecourse operators would embrace the concept". 1. Not much has been said about the sponsors. The notion of "he who pays the piper calls the tune" is something that brand owners are pretty comfortable with -- and it is their money. While some sponsors may be motivated by a deep affection for equestrian sports, others are moved by issues such as value for money, profile-raising for corporate and goods/services brands, co-branding synergies etc. Why should they want to change> The notion that a change might be a bumpy ride in the first few years suggests that there may be some sponsor resistance. 2. Centralisation of sponsorship functions may just have a competition issue. If particular types of deal are only available from one source, there may be a dominant position which leads to market abuse. And if centralisation is effective as a result of the concerted activity of the different segments of the horse-racing industry, the competition authorities may be tempted or induced to investigate. Centralised Sponsorship of Horse-racing? It's and Interesting concept but difficult to achieve in the public domain.